[Updated] The OBA held a press conference today [June 21] to announce two more of their election candidates for the upcoming General Election, with Rodney Smith to run in Constituency #21 Pembroke South East and Dr Grant Gibbons set to contest Constituency #22 Paget East. My name is Rodney Smith, and I have been selected by the One Bermuda Alliance [OBA], to represent you in Constituency #21. It is my privilege to be your representative, and I give you my assurance and that I will work very hard on your behalf. The Election has been set for Tuesday, July 18th, 2ot7. For those of you who will be off the island at that time, the dates for the Advance Polling are as follows: July 11th, 12th, 13lh at the King Street Seventh-Day Adventist Church from 8:00 am. to 8:00 pm. on all three days. Remember, July 14th is only the voting date for those who are in institutions. Please be sure to help us get every vote that is in our favour. Those of you who are traveling will need to take both your ID. and travel documents to the Office of the Parliamentary Registry at the Craig Appin House, 3rd floor, #8 Wesley Street, Hamilton HM 11, in order to pick up an Advance PoII Certificate. Their telephone number is 293 8663, if you have any concerns. This Election is vitally important and it will be decided in favor of the OBA, based on your confidence in us. It has not been easy, but things are turning around. It is your vote that would allow the OBA to continue turning Bermuda’s economy around. That makes your vote critically important. Your vote for me would help ensure an OBA victory in Constituency #21 which could be a turning point for the whole election. I am working hard on your behalf. Many have raised concerns about the need for a new shelter for the homeless which is going to be housed in the Bishop Spencer School. Others have talked about jobs for young people, crime, drugs, and education, and above all the state of our economy. We are putting together our Election Day team. If you are able to assist me, please call 737 8648, or email me at rodneybdasmith@gmail.com Remember every vote counts. Help us to get every vote out on July 18th, 2017. Thank you. First, I would like to thank the constituents of Paget East, who have supported me since 1994. If that seems like a long time, it is. But all those years of public service have given me perspective: I’ve seen Bermuda in good times and bad, through recessions and base closures – as well as prosperous years for local and international businesses. But nothing prepared me for the financial challenges the OBA faced as a new government in 2012. Along with other countries, Bermuda was affected by the 2008 global economic crisis. But the impact was made much, much worse for Bermuda by too much spending, and borrowing, and poor policy decisions. During the good years, no one prepared for the lean ones. But with discipline and determination, the OBA government has moved Bermuda forward. You can see the results from one end of the island to the other. You can feel the confidence returning. In the West End, of course, Bermudians are now seeing firsthand the exciting spectacle of the 35th America’s Cup. All the work by the ACBDA team, hundreds of volunteers, government workers and service providers has paid off to produce a near flawless event, and the benefits to all Bermudians are tangible and long lasting. And – I would just like to give a shout out to Bermuda’s Red Bull Youth America’s Cup team, who are racing this afternoon in the finals. After sailing for just over a year together, they are more than holding their own against some heavyweight international contenders. They have made us so proud! The America’s Cup has exceeded our expectations, creating hundreds of Bermudian jobs and booming business for entrepreneurs, landlords, construction firms, marine services, and taxi drivers, to name just a few. Many Bermudian workers have received significant overtime pay for the first time in a long while. Under the new Bermuda Tourism Authority, tourism numbers are climbing, with 16 consecutive months of growing arrivals. Soon we will have a new Ritz Carlton resort at Morgan’s Point, and a new St. Regis in St. George’s joining the renovated Hamilton Princess and The Loren at Pink Beach. After years of empty promises by the former government, the OBA has delivered, securing the investors we needed to develop four new hotel properties – and we are confident there are more to come. We have a strong record of achievement. But we still have more to do. 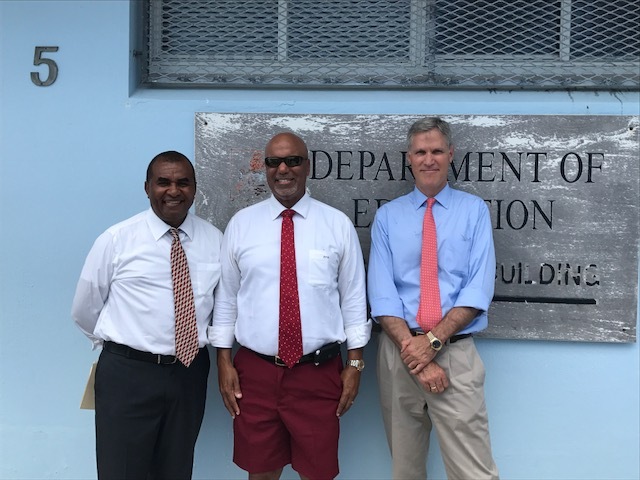 There are still Bermudians who are unemployed and families who are struggling – but with the recovery now well underway Government will have more resources to help those in need. And a good example is the new Salvation Army Shelter, which will be developed on this site. So when you go to the polls on July 18th, consider carefully, and choose to continue moving Bermuda forward together and not back. Mr Smith will run in C#21, a seat which is currently held by the PLP’s Rolfe Commissiong, who won with 53.55% of the vote in the last General Election. 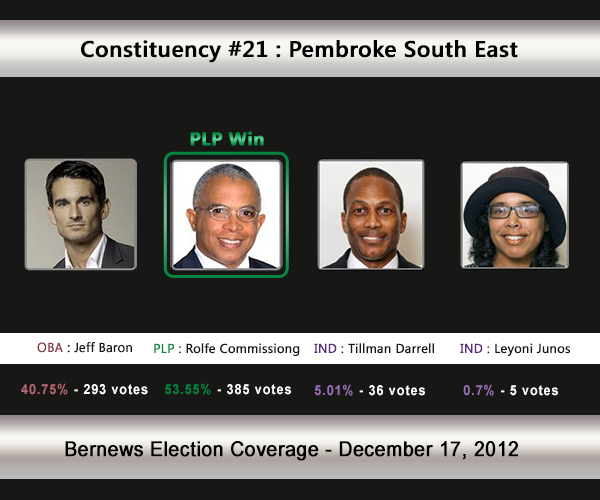 The results from C#21 in the 2012 election are below. 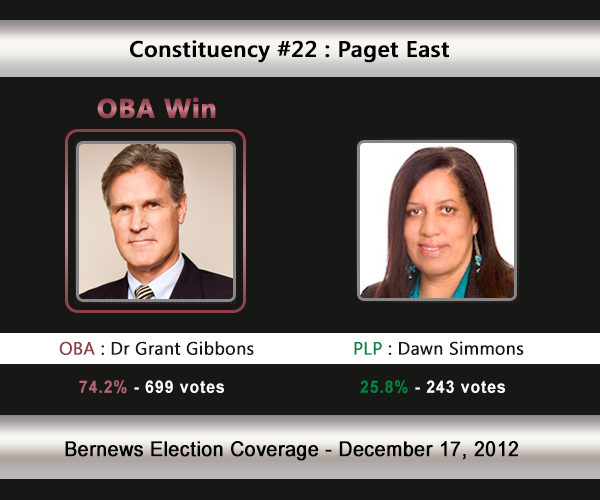 Dr Grant Gibbons is the incumbent in C#22, having won with 74.2% of the vote in the last General Election. The results from C#22 in the 2012 election are below. O.B.A.’s, “yes man” is back again. U kno nothing about ya boy! Shut ya mouth! If anyone is for helping Bermudians in a big way it’s the gibbons family! You also need to shut ya mouth up also, when you start running your mouths about the PLP members and don’t know anything about them. Therefore it works both ways. Yes he is a “yes man”! Was talkin bout de other guy. Grant Gibbons being announced as a candidate in the 42nd area. ” Please be sure to help us get every vote that is in our favour.” – sounds like something he’d say in an OBA meeting, not to the population at large. Something off-putting about that. That a sentence taking from a letter I gave out. What is your issue with that ? And yes, I need every vote I can get. Do I have your vote ? You also need to shut your mouth up also, when you make accusations about PLP members which you don’t know anything about. It works both ways. Yes, he is a “yes man”! Somehow I just don’t trust Grant Gibbons . Probably the most trustworthy of all people up de hill to be honest!